The best way to get to know a community is by scheduling a tour. See the facilities, meet the staff and residents, and get a feel first hand what it's like to live at Stone Brook Assisted Living & Memory Care Assisted Living. Stone Brook Assisted Living and Memory Care is the community that families and their loved ones choose because we are a family-like community where staff and residents are friends, and everyone greets each other with a smile. We also deliver supportive services in a respectful manner so our residents may continue to enjoy their independence. 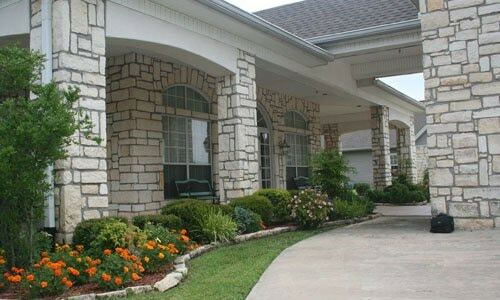 Stone Brook Assisted Living and Memory Care is a locally owned and operated senior living community in Denison, Texas. For families living in northern Texas and southern Oklahoma, we are proud to be the community of choice when they are seeking care for their loved ones. We offer a variety of floor plans to meet our residents' lifestyle requirements. Your loved one can choose from a studio or one-bedroom floor plan, and there is also a companion option. Apartment features include a kitchenette, an emergency call system and closets. Best of all, furry friends are welcome to move in too. Every day at Stone Brook Assisted Living and Memory Care we offer a variety of activities that keep our residents laughing and having fun. Exercise classes, table games and holiday celebrations are just a few of the daily offerings. For a quiet moment alone, residents may relax in the courtyard or one of the several common rooms. Our residents enjoy three, freshly prepared meals served restaurant-style every day, and healthy snacks are provided between meals. We also provide scheduled transportation for errands and medical appointments. Weekly housekeeping and personal laundry service frees everyone from daily chores so they spend more time having fun. Respecting our residents' dignity, independence and individuality is of great importance to us, and all of our staff feel the same. Each resident receives a care plan that outlines the level of services we will provide. Caregivers are on site 24 hours a day and nurses are available when needed. We can also arrange for physician visits. Stone Brook Assisted Living and Memory Care is proud to be the community of choice for seniors and their families who are looking for a homelike setting.